I am doing Navratri fasting for 9 days, so thought of sharing Fasting recipies which I would be preparing during these days. We can eat Sabudana ,Kottu atta,Singhara (Indian water-chestnut) ,Potato ,Sweet Potato,Groundnuts,Coconut ,Rajgira and Fruits during the fasting days. 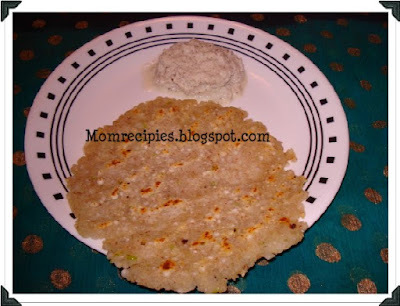 Today I will share recipe for Sabudana thalipeeth which is very forgiving. If you use boiled and mashed potatoes, you can add a few spoons of rajgira (amaranth) flour or Sabudana flour for binding and stay within the upwas (fasts) restrictions. 1) Soak 2 cups of sago by placing it in a bowl, then rinsing once with water, then adding enough water to just cover the sago in the bowl. Cover and leave overnight or 5 hours. Your sago will swell well and becoming a bit rubbery and soft. This results in perfectly fluffed sago.Keep it aside. 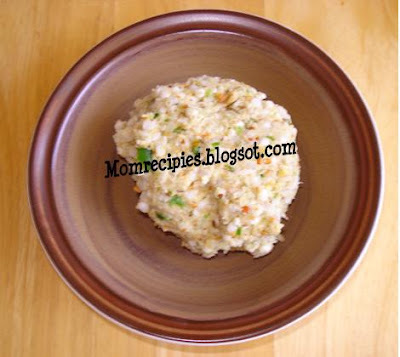 2) Boil the Potatoes in microwave or in pressure cooker. Peel it then mash it. 3) In a big bowl add soaked sabudana , mashed potato,groundnut powder,salt ,sugar, green chilli paste, cumin seeds ,sabudana powder and mix well to a soft dough, except ghee. 4) On a thick plastic bag/ sheet, place a tennis ball size ball of the dough and pat it with hands into a round roti shape or flat bigger circle. See that roti should be thick and should not break. 5) Heat a non -stick pan. 6) Gently transfer it to the hot non stick pan. Put ghee around it. 7) Cook on both sides to a until nice golden colour and crispy. Serve with Yogurt / coconut chutney of your choice. Grind all the ingredients to smooth paste. Add seasoning of cumin seeds. Happy Navarathri/Dusshera, Sireesha! The thalipeeth looks yum. How long do you soak the sabudana? Soak 1 cup of sago by placing it in a bowl, then rinsing once with water, then adding enough water to just cover the sago in the bowl. Cover and leave overnight. This results in perfectly fluffed sago. Very interesting and useful recipe. Wow, you are fasting? Great Sireesha! Happy Dasara! Sabudana Thalipeeth looks and sounds so delicious. Happy Navaratri . and this is somethng i have never had. That's one of my favourites...nice to read your recipe. Happy navarathri Sireesha..Thalipeeth looks prefect.. Thanks for the info, Sireesha! Happy navratri to you too dear and very nice and usefull recipe. You can buy fresh flours and spices online at www.chandrikamasala.com, we also carry thalipeeth, malvani and goda masala. Great recipe, yo ucan now buy Fresh Flours and Spices at www.chandrikamasala.com, we grind everything in Houston. We also have Thalipeeth, Malvani and Goda Masala.